For many business men and women, attending or even presenting at conferences is a regular part of their job. However, when faced with the task of actually planning or coordinating a conference, they may not even know where to start. Even a small meeting with only a handful of participants will involve a level of logistics planning that is quite complex. This includes the more obvious things like booking and setting up meeting rooms, catering for lunches or snacks, and coordinating parking. It also includes other things that people may forget, like having the proper audio visual equipment available and enough signage so that people are able to find their way to and from various rooms. Fortunately, many conference facilities or hotels will offer complete packages, including an expert to guide the planning process. 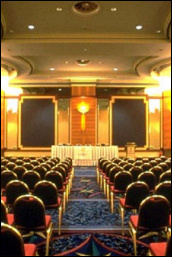 When choosing a conference facility, price and location are often the two main driving factors for the decision maker. For companies based in a large city, managers may find that travelling a short distance to even the immediate suburbs can save a large amount of money. This is based on several things; parking in any city is usually going to cost at least ten to twenty dollars per car. Facilities in suburban areas often have free parking or deeply reduced fees. Square footage costs outside a city are also much cheaper. Even when reimbursing employees for travel or paying for transportation to a facility further away, a company can still save money. Once the facility is chosen, an event planner will often take care of all the necessary details. Sometimes, they will simply be able to ask the company representative guiding questions in order to gain an understanding of everything they need and expect for the conference. They will help you determine how the rooms should be arranged and if coffee and snacks should be provided during breaks. A skilled planner will even be able to help design the schedule in order to meet all the objectives while still allowing participants to enjoy themselves. Keep in mind that for a first-time conference planner, the task can be quite daunting, but there are a lot of resources available. Talk to other colleagues or the hotel/conference center staff. There are also websites that can provide checklists or sample questions to consider when getting things set up. Choosing a conference facility is a big decision for anyone looking to host a conference or series of meetings. The facility will set the tone of the entire event and can contribute to the overall success or failure of meetings. Even for internal meetings, employees want to be impressed by the time and effort their company took to plan an event like a training or skill building workshop. The facility can be doubly important when hosting external guests like current or potential clients. Even though everyone would like to hold their conference at the most high-end conference center or swankiest hotel in town, this is not always a possibility due to things like availability, budget or location. For last minute conferences or events, choices are usually limited to places that will still be available. That is why it is important to identify locations well in advance. For large or complex events, this may be a year or more prior to the date. Many firms find it advantageous to establish relationships with local venues that will make rooms available to them because they are frequent users. Budget is often the largest deciding factor is choosing the venue. Fortunately, even the nicest places have a large degree of latitude when negotiating prices. For instance, many venues will give a discount to someone who simply asks for it, especially if they believe that it will bring in additional business. Many hotels and conference centers will have packaged deals that include snacks or meals for participants, which can reduce the overall cost compared to bringing in a separate caterer. Location of the venue is also an important consideration. For most events, the location is very flexible and can be changed due to availability or to meet budget constraints. For instance, by moving a conference to the suburbs instead of downtown, the cost can be dramatically reduced, even when considering additional transportation costs for participants. However, costs should not be the only consideration when choosing a location. If many participants are coming from out of town, they may prefer a location in the city that has other attractions, instead of being stuck in a hotel with no nearby facilities. Before entering a final agreement with any conference venue, be sure to request a number of references that will provide honest feedback and information about their experiences. The internet is also a great resource for finding reviews about a location. Simple consumer feedback may help avoid any hidden costs or future disappointments. These reviews can also point out hidden gems that were not previously considered.